University of Thessaly, Larissa, Greece. 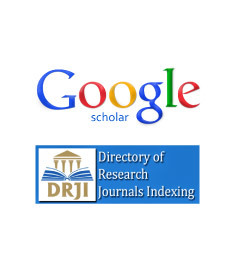 Copyright: © 2017 Tsoucalas G. This is an open-access article distributed under the terms of the Creative Commons Attribution License, which permits unrestricted use, distribution, and reproduction in any medium, provided the original author and source are credited. In the beginning of the 19th century, in Montpellier, four innovative neurosurgeons, Gruveilhier, Lallemand, Rech and Delpech, introduced the on sight use of the "chariot rotator for mobilization of the vertebral column". This wooden machine was at the era used to mobilise de novo a defected spine, in order to restore its normal form, as surgery was considered traumatic and most probably fatal. In 17th century France medicine was ready to explode towards a new more sophisticated scientific path. While the influence of the ancient Greek physicians was apparent through "Hippocratism", "Galenism" and "Aristotelism", rationalism, and empiricism also appeared. This was the era of the "Scientific Revolution", a major turning point in the history of science. Instead of asking why things occur, physicians and researchers turned to how things happen, a shift in emphasis from speculation to experimentation. Interpretations became mechanistic, and the language of science became mathematical. 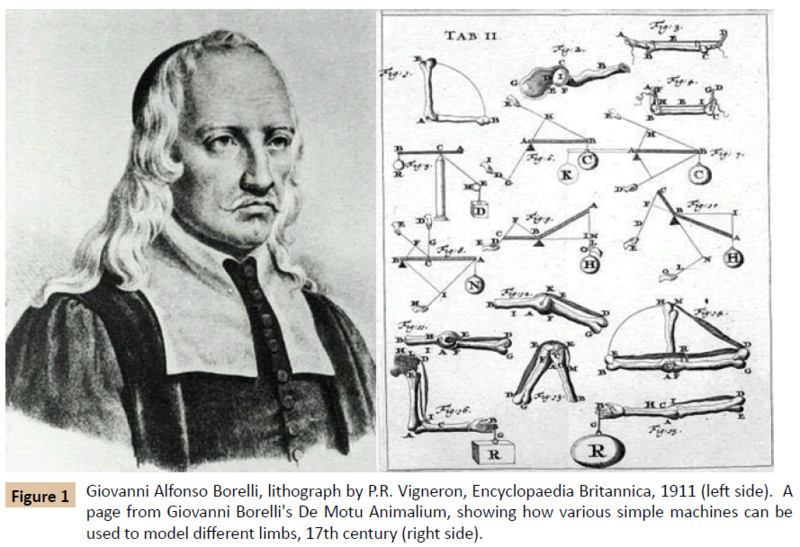 Giovanni Alfonso Borelli (1608-1679) was the leading iatromechanist of the 17th century (Figure 1). Influenced by the views of the polymath Galileo Galilei (1564- 1642), he sought to apply his mechanical principles to medicine. Starting with a simple unit, the muscle, and then expanding his investigation to more complex systems in the body, he finally studied the whole organism, depicting it as a well functioning machine. The "iatromechanics" appeared to introduce and evolve the use of machines in the aid of diagnosis and treatment. The need for both was well established during an era with undergoing social reforms and "Humanism" appeared [1,2]. Figure 1: Giovanni Alfonso Borelli, lithograph by P.R. Vigneron, Encyclopaedia Britannica, 1911 (left side). A page from Giovanni Borelli's De Motu Animalium, showing how various simple machines can be used to model different limbs, 17th century (right side). 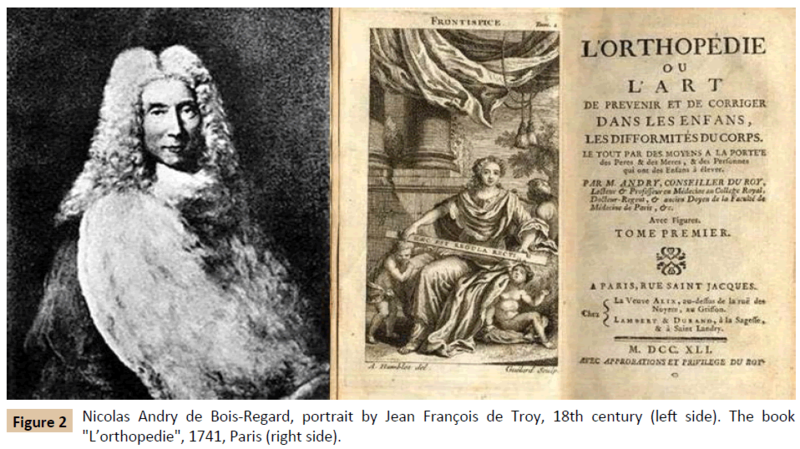 It was Nicolas Andry de Bois-Regard (1658-1742), the famous French physician, who wrote during 1741 his masterpiece called "L’orthopedie" (English: orthopaedics, Greek: ορθοπεδικÃÂ®) (Figure 2), introducing the ancient Greek term into French medicine. Figure 2: Nicolas Andry de Bois-Regard, portrait by Jean François de Troy, 18th century (left side). The book "L’orthopedie", 1741, Paris (right side). The bone surgery, reduction, reconstruction and regeneration were well established in France since the early 15th century. The Hippocratic dogmas were infiltrated in all the pioneering minds of the French physicians [2,3]. Hippocrates was the first to introduce the method of the mechanical reduction of the vertebral column with "extension under constant tension", with the sufferer lying in a wooden bedstead . Iatromechanism (Greek: ιατρÃÂς=iatros=physician, μηχανικÃÂ®=mechanice=mechanics) was a movement flourished since the early 17th century, combining anatomy, physiology, physics, mathematics and mechanical engineering to explain human organism under the purpose to ameliorate the treatment in medicine . At the early 19th century, medicine in Montpellier was in its prime and all previous scientific movements were well adopted. Jean Cruveilhier (1791-1874), professor of operative medicine, anatomy and morbid anatomy, the writer of the treatise "Traité d'anatomie pathologique générale" (General treatment of the pathological anatomy), avid scholar of the musculoskeletal system, suggested the manufacture and usage of various machines for the correction of bony malformations, luxations and fractures [2,6]. Cruveilhier understood that the central nervous system (both the brain and the vertebral column) could only be post mortem examined, and invasive surgery was to be avoided as it could most probably lead to death, or central, or peripheral paralysis at the best . Thus, he was really curious for the use of machines that could simulate and/or stimulate various body functions (iatromechanism). Claude-François Lallemand (1790- 1854), professor or the "Outpatient clinic" of the University of Montpellier, fond of audacious methods in medicine, an expert in neurology, great anatomist and master of autopsies, he had soon adopted the newly "Gruveilhier perspective" during his military career. André-Pamphyle Hippolyte Rech (1793-1853), an orator to cure neurological and mental diseases, founder of the "Asylum for the treatment of the mentally ill" in Montpellier, was as well an enthusiast towards every innovation that could help in neurology. Influenced by Gruveilhier's views, all three adopted the Hippocratic idea of immobilization of the vertebral column in order to be fixed through the use of a machine, a machine to serve neurosurgeons. They had realized that the spine correction should be performed as soon as possible when a trauma was implicated, and that the method should be availliable to the common people, in private small infirmaries, even in province, or to soldiers during a battle . Under the guidance of the ingenious (and senior) Claude-Jacques-Matthieu Delpech (1777- 1832), professor of Surgery with military experience, they had authorised the usage of the "char rotateur pour mobilisation de la colonne vertébrale" (chariot rotator for mobilization of the vertebral column) (Figure 3). This mobile wooden machine could mobilise de novo a defected spine to restore its normal form, allowing finally the immobilization of the whole column for a time period of extension with constant tension, to facilitate vertebrae to move into their correct position. Delpech was an innovative surgeon, the writer of "L' Orthomorphie" (On the correct form). He was an authority in functional rehabilitation in all congenital or acquired bone diseases, introducing new methods of rhinoplasty, tenotomy of the Achilles tendon, and various mechanic interventions wonderfully depicted with a series of lithographs inside his work. He was the first to propose the in sight treatment of all deformities of the vertebral column after a trauma, introducing the idea of mobile medical machines in the eve of modern orthopaedics [8,9]. Figure 3: "Char rotateur pour mobilisation de la colonne vertébrale", Claude-Jacques-Matthieu Delpech, Atlas inside L'Ortho orphie, 1828 (left side). Jean Cruveilhier, Claude-François Lallemand, André-Pamphyle Hippolyte Rech, Claude-Jacques-Matthieu Delpech, portraits University of Montpellier (right side, from top to bottom). The "chariot rotator", although popular when introduced, soon disappeared as heavy traumas of the spine were treated with hospitalization, while researches found the broken vertebrae needed a more stable fixation. The main principal though endured, mostly used nowadays in the case of a light trauma, or back pain, as kinematics proved mobilisation to be able to restore lost movements of the spine in any of the three anatomical planes . The explanation in medicine of phenomena as objects in motion resembling machines, when nature obeys mechanical laws, including living bodies, this was iatromechanics. Machines were manufactured, resembling movements, mobilization or immobilization of the human body to aid physicians. 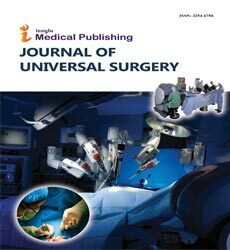 Gruveilhier, Lallemand, Rech and Delpech, all members of the Montpellier School of neurosurgery, formed an innovative quartet to construct, introduce and expand the use of the "chariot rotator for mobilization of the vertebral column", availliable on sight, for all, soon after a trauma . The principal of their view endured and is still somehow in use. Fischer LP (1987) La Médecine à Lyon, La chirurgie orthopédique. Paris, France: Hervas 411. Kohler R (2010) Nicolas Andry de Bois-Regard (Lyon 1658-Paris 1742): The inventor of the word “orthopaedics” and the father of parasitology. J Child Orthop 4: 349-355. Hippocrates (1846) Complete Works of Hippocrates. Paris, France: Baillière. 4: 190-200. Webster C (1974) The Intellectual Revolution of the Seventeenth Century. Routledge & Kegan Paul, London, UK. Genty M (1934) Jean Cruveilhier, Medical biographies. J-B Baillière, Paris, France. Delhoume L (1937) The School of Dupuytren: Jean Cruveilhier. J-B Bailliere, Paris, France. Serre M (1834) Éloge historique du Prof. Delpech. Montpellier. Martel J, France. Delpech JM (1828) L’Orthomorphie. Gabon, Paris, France. Lee RY (2001) Kinematics of rotational mobilisation of the lumbar spine. Clin Biomech (Bristol, Avon) 16: 481-488.